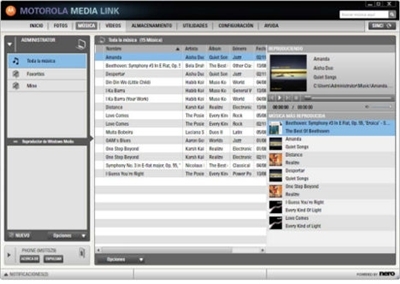 The Motorola Media Link has been developed for free for the Motorola Android users to allow them to manage their phone through the MAC more easily. Features included: Download any content from online websites and store it on the phone directly; Direct photo upload to the most popular websites; Access the phone content by using the MAC directly; Playlist synchronization; Resize and edit the photos to match optimum parameters for the device,etc. - Organize content as easy as possible. 2. Check Compatibility to see if your phone is supported. 3. iTunes, iPhoto, Mac, and Mac OS are trademarks of Apple Inc., registered in the U.S. and other countries. Rip DVD and other video formats to iPod Video and manage iPod content for Mac. Rip DVD and convert video files to all sorts of video and audio file formats. It rips DVD to AVI, MPEG, DIVX, MP4 video formats and MP3, AAC, M4A files. Qweas is providing links to Motorola Media Link for Mac 1.5.1 as a courtesy, and makes no representations regarding Motorola Media Link for Mac or any other applications or any information related thereto. Any questions, complaints or claims regarding this application Motorola Media Link for Mac 1.5.1 must be directed to the appropriate software vendor. You may click the publisher link of Motorola Media Link for Mac on the top of this page to get more details about the vendor.